No matter where you roam, you'll never be lost for words. The Mobile Translator enables your Windows Mobile device to translate texts, look up words, and conjugate verbs on the go. It's the killer app for your busy life! The IdiomaX Mobile Translator for Windows Mobile converts your Pocket PC, Handheld, PDA or Smartphone into a mobile translation device that goes everywhere you do. Translate text, consult dictionaries, and conjugate verbs in five different languages without missing a beat in your busy schedule. It takes years to master just one language. The biggest challenge for most language learners is verb conjugation. Our mobile translation software does the work for you in record time, providing conjugation and translation in an instant. You get English, French, Spanish, Italian and German... all in the palm of your hand. Stuck for a word or phrase in a foreign language? 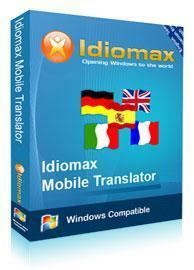 IdiomaX Mobile Translator for Windows Mobile gives you on-the-spot help. The translation software lets you read websites and other documents in another language, no matter where you are... in the car, bus, train or plane. Between classes or meetings. Between home and work. Anywhere, anytime. Translate text that's typed in or copied from an application such as Pocket Word, Outlook, etc. Microsoft Windows Mobile 2003 SE, Microsoft Windows Mobile (WinMo) 5.0, 6.0, 6.1, 6.5, 6.5.1 and 6.5.3. Microsoft ActiveSync or Windows Mobile Device Center installed on your PC. IdiomaX Mobile Translator is compatible with most smartphones, cell phones, PDAs, mobile phones or Pocket PCs running the Windows Mobile(WM) operating system. Even if you don't see your phone on this page, any Windows Mobile based smartphone, cell phone, handphone, Windows phone, mobile phone, PDA or Pocket PC will work.